LEGAZPI CITY—The Bicol University (BU) held the public presentation and open forum of qualified candidates for the presidency of the university at the BU Amphitheater this morning. 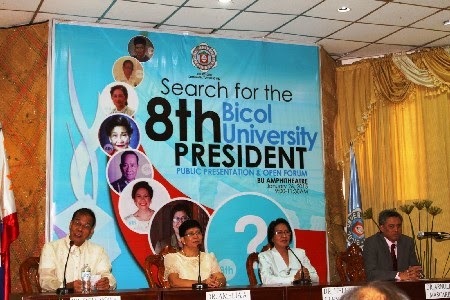 The event is expected to serve as an avenue for the candidates to present vision, mission and goals for the institution. The candidates are University of the Philippines (UP) College of Agriculture Dean Dr. Domingo Angeles, BU Vice-President (VP) for Administration Dr. Amelia Dorosan, BU VP for Academics Dr. Helen Llenares and BU Research and Development Center Director Dr. Arnulfo Mascariñas. From these applicants, the BU Board of Regents will elect the 8th university president.